The Casio PX-850 features a full keyboard with weighted keys utilizing Scaled Hammer Action with three layers of touch sensitivity. Its Acoustic & intelligent Resonator sound source captures acoustic grand sound and the PX850 produces this sample beautifully. Also impressive is the instrument’s 256-tone maximum polyphony, the highest of any digital piano on the market. The PX-850 keyboard features 88 touch-sensitive keys with Scaled Graded Hammer Action. In an acoustic piano the speed at which different sized hammers operate affects the sound, and that process is seen in the PX-850’s velocity-sensitive keys. The keys can be adjusted to three levels of sensitivity or it can be turned off. The key texture is also designed to mimic the ebony and ivory keys on an acoustic piano for enhanced realism. The Privia line of Casio digital pianos features its Acoustic and intelligent Resonator technology. Using over three times the memory of models in the previous generation this mechanism processes samples recorded from four dynamics to offer true tones of the grand piano. The damper response, String Resonance and Hammer Response simulate the realistic sound of the strings when the damper pedal is engaged. The USB Connectivity provided with Privia digital pianos allows them to be used with Windows or Mac computers without needing to download drivers. The Casio PX-850 has a greater maximum polyphony than any digital piano available on the market. This ensures complex passages or advanced pieces will not be difficult to accomplish as no tones will be masked or clipped. Duet Mode divides the keyboard into two halves, allowing for tutors and students to use the piano simultaneously during instruction. The two-track recorder can be used to capture and playback practices and performances. The Casio PX-850 features authentic sensation when compared to an acoustic grand. The weighted keys along with their simulated texture make the experience much like the real thing. So, if you’re looking for the best digital piano with weighted keys, the PX-850 is a good option. This model also has the highest reported maximum polyphony of any digital piano on the market with 256 tones. The sound mechanism is sampled from four dynamics, customary for Casio’s Privia line. Additionally, the unit matches with its stand, cover and pedal board to provide a sleek and subtle addition to any décor. The drawback to the model is the possibly of clicking keys as reported by some users. Authentic Feel – The weighted hammer action provided by the PX-850 in addition to the simulated ebony and ivory textured keys give it a feel very much like that of an acoustic grand. 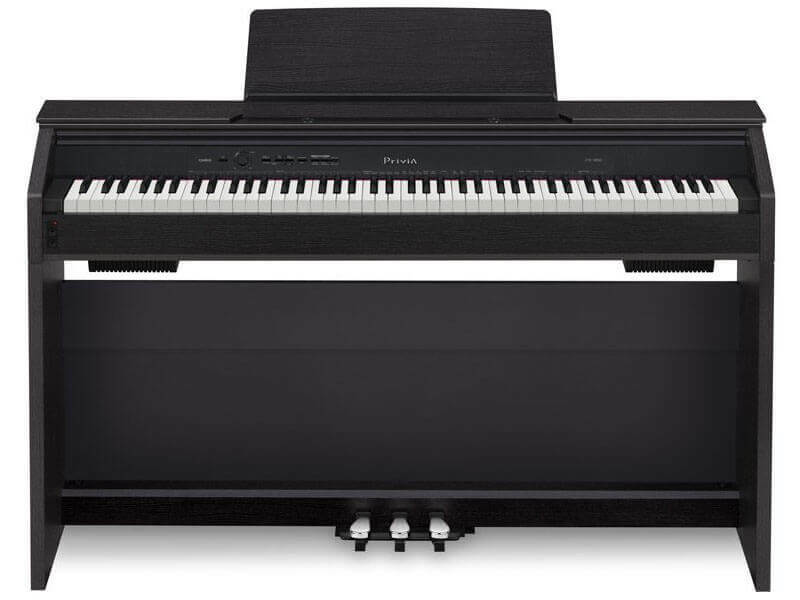 Polyphony – The PX-850 has the greatest maximum polyphony for all digital pianos on the market. The 256-tone polyphony allows each tone to be expressed when complex portions are played in more advanced pieces. Acoustic and intelligent Resonator – The advanced sound engine found in the Privia line replicates the tonal integrity of piano samples recorded at four dynamics to offer the most authentic and rich tone possible. Esthetic Quality – The model can be outfitted with a matching keyboard cover, pedal board and stand, making it a complete instrument that can fit with the décor of any surroundings. Key Noise – Some users have reported a clicking sound after continuous use. This sound may distract from the ability to concentrate on play. The problem was only reported in some instances. The Casio PX-850 is top-quality digital piano that is built with the pianists in mind. Its AiR technology produces a true acoustic grand sound with a 256-tone polyphony made to handle the most complicated play thrown at it. 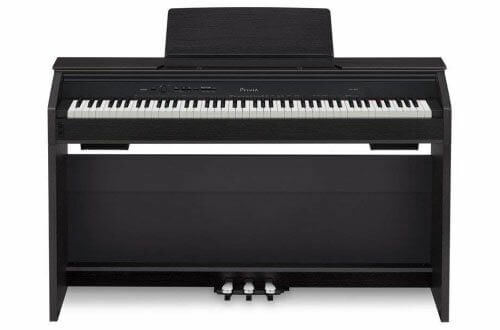 The PX-850 is perfect digital piano for beginning players, but it also has features that may attract advanced users as well.